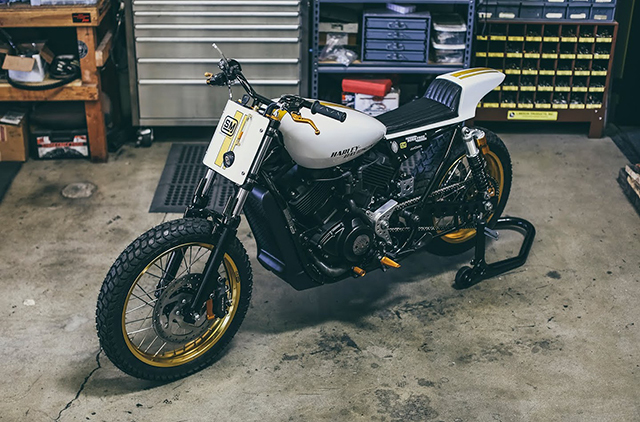 Speed Merchant engineer and designer Brandon “Brawny Built” Holstein decided to build the bike with a nod to the Flat Track tradition. He started by removing most of the stock parts from the bike. Front end, wheels, bars, rear fender, battery, rear subframe, and exhaust – shedding 50lbs (22kg) from the stock bike. He replaced the stock wheels with some Sun Aluminum rims with SS spokes laced up to HD hubs. 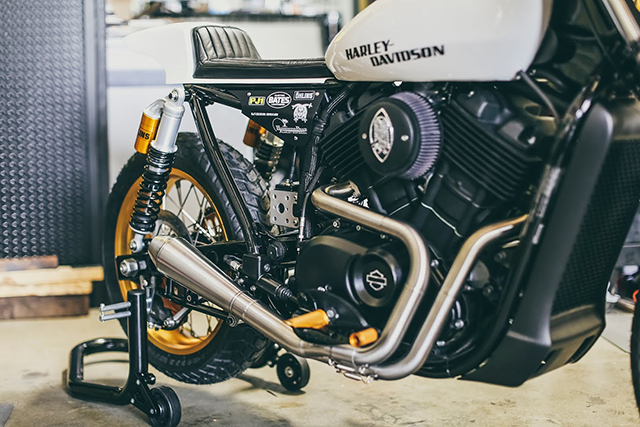 The front end was replaced with a set of Speed Merchant mid glide trees made for the HD 48 Sportster. Huntington Beach Harley Davidson donated the front end to the build. They topped off the front end with SM preload adjusters. 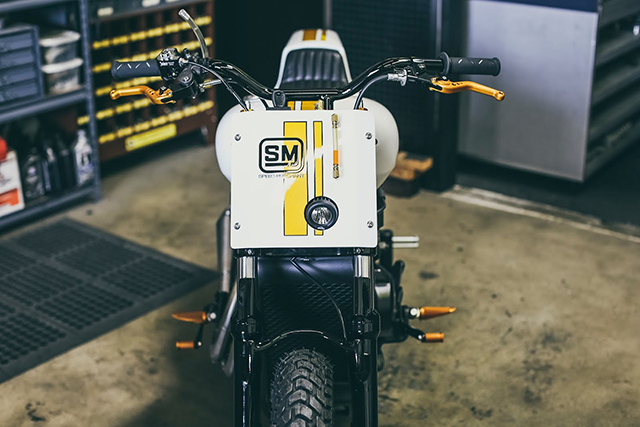 To finish up the front, Brandon made a classic styled aluminum number plate that incorporate the overflow for the radiator and a LED driving light supplied by Lazerstar Lights. Brandon used a Speed Merchant radial mount brake bracket up the front and mounted a Tokico caliper to it. The bars are a custom set made in house as well. The controls are off a GSXR 600, and 750, topped off with some Pazzo levers. The throttle is a 1/4 turn set up from Joker Machine – used mainly for speedway. 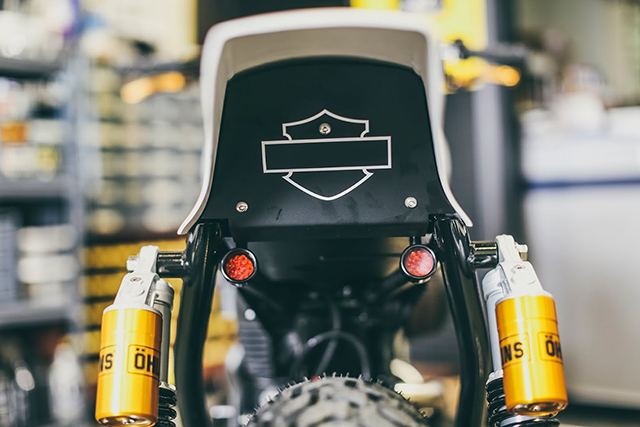 To change the stance of the bike, the guys at Speed Merchant used some tall rear shocks supplied by Ohlins USA. 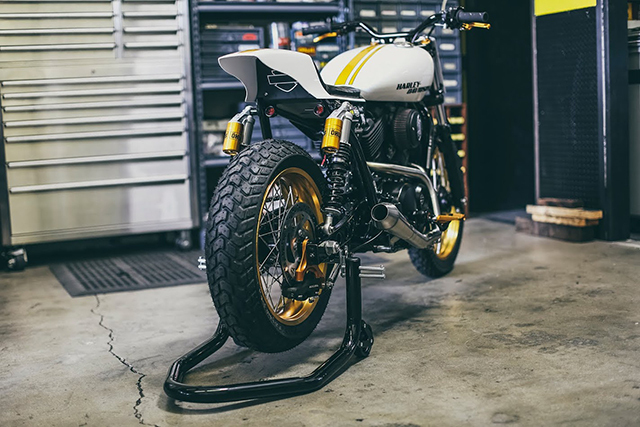 “They were kind enough to support this build.” The taller shocks provided extra ground clearance and helped to enhance the stance of the bike. 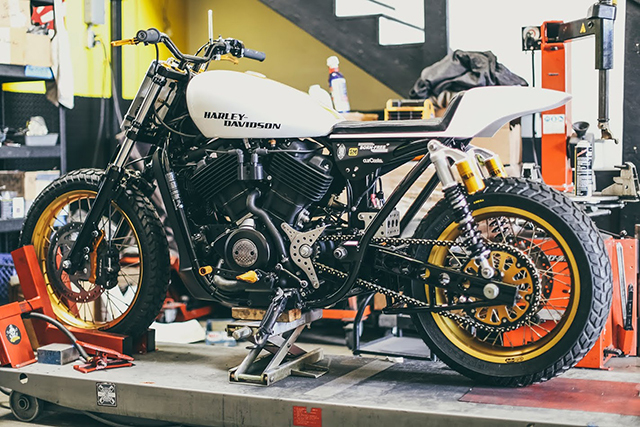 To round off the rear section of the bike, Brandon decided to modify the rear swingarm by adding some extra bracing and hollowing out the square tubing. Then they made a battery box to mount the 8 cell Anitgravity Battery just above the swingarm. The last thing that SM fabricated was the custom exhaust. 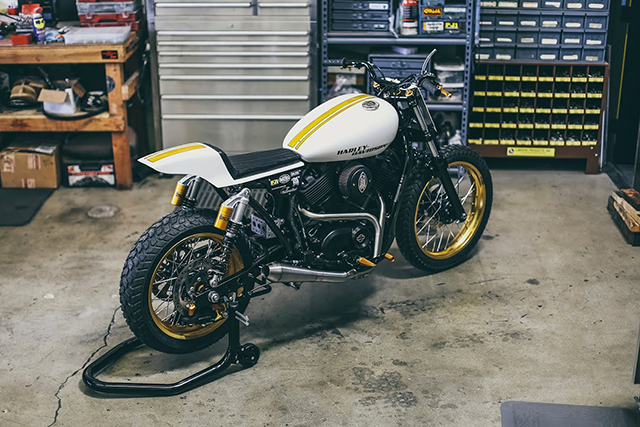 Cone Engineering donated a 2″ core muffler for this build. 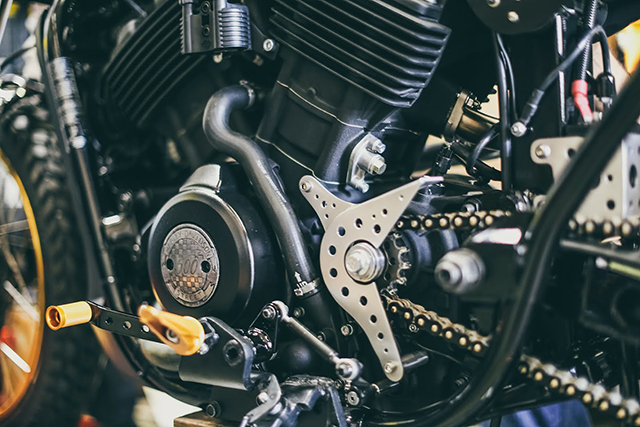 Brandon used this and then recreated the front headers to fit the bike – a full stainless system is just what the doctor ordered. The paint was done by John Edwards of Old Tyme Custom paint. 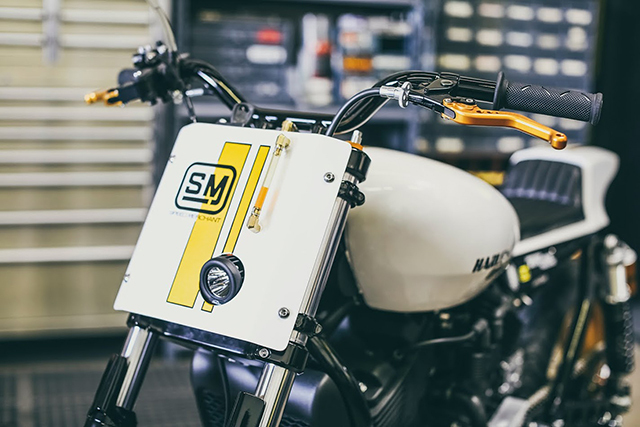 SM wanted to keep it really clean and simple, but highlight the gold on the bike. 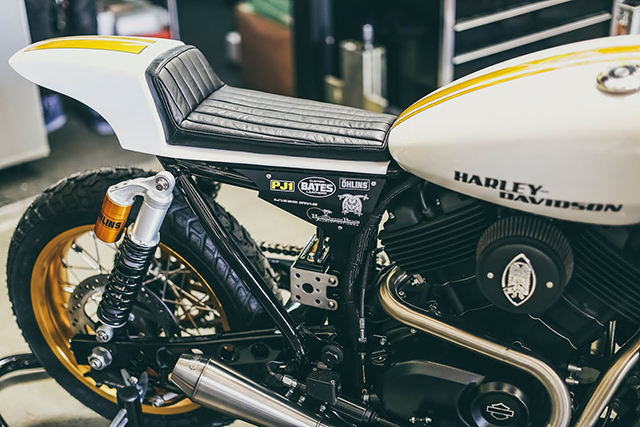 Once the color was laid down the bike was handed over to Pacman Line & Letter Company to pinstripe and hand letter the Harley-Davidson. Then finally some pearl was laid over the top before clearing it.